Pictures always provide us with lasting memories on special occasions. Instead of taking pictures of other people, you can join in on the fun with Kansas City photo booth rentals. You can use our booth to take photos of yourself with friends or family and even share them on social media. Photo Booth Rentals in KC are Fun for Everyone! While some of your older guests will be familiar with photo booths, many of your friends or younger guests won’t, but they will quickly discover how much fun they can be. Especially when your Photo Booth is social media friendly. Our photo strips or 4×6 prints can be emailed, texted to a phone, or posted on Facebook. Our customers also receive a USB drive of all the fun party pics after the event ends. You can make any occasion fun by renting a photo booth in Kansas. Rent one for a class reunion party or for a school carnival, corporate Open House, post prom or graduation party. Hiring a photographer for events can be expensive and disposable cameras require you to develop the film before you have copies of the photos that were taken during the event. However, with a photo booth, you will have pictures that you can show off in just a few minutes. 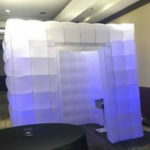 Photo booth rentals are a great compliment to your Kansas City Inflatable Rentals.